Rural baroque and south bohemian village belong together. You can never find so many quaint and charmingly decorated gables on one place of rural homesteads as in South Bohemia. For its gables, richly decorated ornaments and stucco, the rural baroque became a unique architectonic phenomenon. The area with an abundancy of rural baroque architecture evidence is Blata. 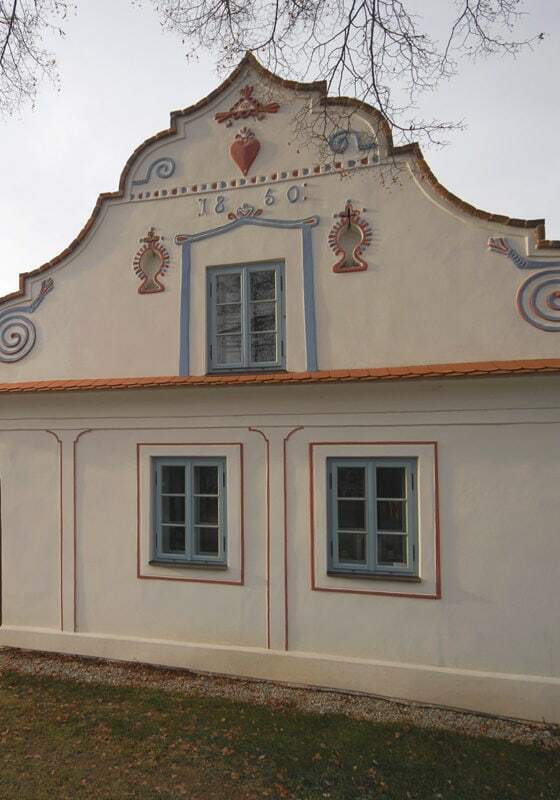 Homestead Malé Chrášťany no.4 was rebuilt in the style of baroque in 1850. We in fact know the author, whose name is Šebastian Brenner, the master of Plástovice area. 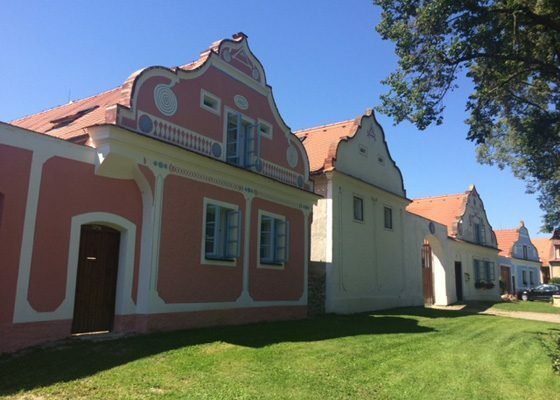 The homestead Malé Chrášťany no.5 was rebuilt in 1856 by the same author and his bricklayer party. During our reconstruction, we discovered the remains of the original wooden logs under the plastering. The chronicles do in fact confirm that in the first half of 19th century, there was a vast rebuilding of the village and contemporary homesteads are based on the older foundations of the middle age log houses. One of the first written references about Malé Chrášťany goes far back as the year 1273. Other written references about the homesteads no.4 and no.5 are in the Josef land registry from the year 1785. Only 100 metres from the village, a path named Formanická cesta originally led in the direction Linec – Prague, before it was destroyed by a the construction of a railway. The oldest settlement of the village is confirmed by archaeological findings (shards and fragments of ceramic) from the period of 0 – 400 A.D. in the place following on the prehistorical settlement. The location of the prehistoric settlement was found in 1999 roughly 300 metres west from the homestead no.4 – thus our Wellness Hotel Boží Oko. 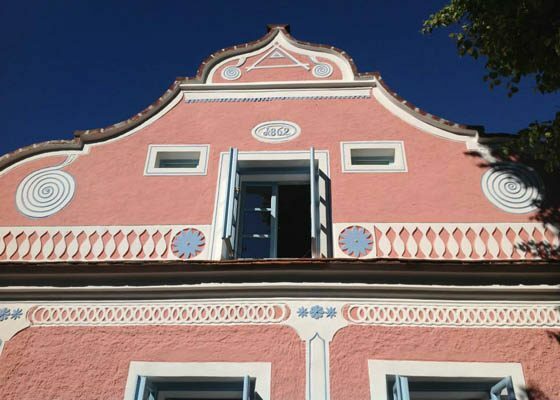 The stylized stucco God´s Eye symbol can be found on the frontal gables of homesteads. But only in one of the homesteads can you find a unique hotel with even more unique interior. The owner of the hotel gave it its name right after the stucco symbol mentioned earlier. The symbol itself dominates the top of the gable in the residential part and granary of both homesteads. The God´s eye is placed in the middle of the triangle with flames in the corners; it signifies the triple singularity of God. The God´s eye protects the health, wealth and harvest of a farmer as well as protecting the inhabitants of the homestead against evil people and adversity of faith. The gable of the homestead no.4 has a significant cultural and historical value. It is decorated with sacral stucco elements and considering its rich decoration, it is very probable that the wealthiest farmer of the village used to dwell in here. You can see a stucco chronograph 1850 (marking the date of finishing the reconstruction of the residential part of the house), separating strip with horseshoe motive, flaming heart – the symbol of undying faith, spiral motive on the end of stylised palm (blooming palm seed representing the periodic cycle of birth and death in the nature), a bishops staff – resembling a shepherds cane, monstrance in the shape of fish ended by a cross (fish being a Christian symbol – in the Greek language ICHTHYS is a hidden anagram of letters: I – Jesus CH – Christ Th – Godly Y – Son S – Saviour) – it represents the rebirth and eternal life of Jesus Christ. The gable of homestead no.5 decorates the God´s eye and bishops staff at its top. Further, you can see a stucco chronograph 1856 (the date of the reconstruction completion). Above the ledge lies a border of the Christian fish standing on their tail. Below the ledge you can see a dividing stripe made of horseshoes – resembling the farming use of the homestead. Motives of flowers then add to the decoration of the gable. This gable also bears a significant cultural and historical value. In the hallway of the residential part of homestead no.5 there is a stucco rose placed on the arched ceiling which is monumentally protected. Both homesteads no.4 and no.5 belong to the monumental reserve of folk architecture Malé Chrášťany and are protected by the state immovable cultural heritage since 1995.